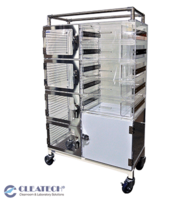 Cleatech® Polypropylene powder containment hood (VCE) is USP 800 compliant, can be used for non-sterile compounding of hazardous drugs as in bio-safety hoods Class I. 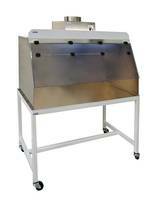 Hood and work surface are constructed from corrosion resistant polypropylene. 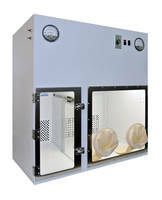 They are available in 24″, 32″, 36″ and 48″ hood's width. Cleatech powder containment enclosures feature rear baffle (slotted panel) located in the back of the hood that's designed to reduce turbulence, to ensure the work surface is well ventilated.The front airfoil at the hood face allows more even airflow into the hood by avoiding sharp curves that can create turbulence. It's removed for cleaning purposes. 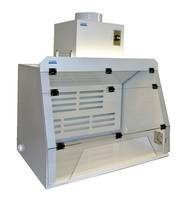 Available as ducted single filter hood or ductless hood with redundant HEPA filters. 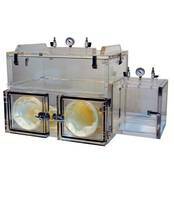 Polypropylene Glove Box are compliant to ISO 5 and USP 797 standards. 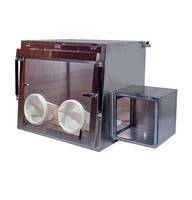 1500 Series Desiccator Cabinet comes in different types of materials.